What is OOG (Out of Gauge)? OOG (OUT OF GAUGE) is short for out of gauge container or out of standards containers; OOG containers could be divided into Open Top Container and Flat Rack Container, and Flat Rack Container is shorted as FR. Open Top Container is used to carry heavy and/or bulky finished products, which handling and loading can only be performed with a crane or a rolling bridge. And Flat Rack Container is dedicated for the carriage of heavy, bulky as well as over height and/ or over width items. To those items that are over length, over width, over height and over-weight, break bulk (2 OR MORE FLAT RACKS as bed = BREAK BULK, that is BB CARGO) is the suitable way for delivery. Cargo that has excess height, excess width and/or is heavy can be loaded pre-lashed on a flat rack or conventionally. Pre-lashing means the cargo is loaded first in an open-top container or on a flat rack, and lashed there before both are lifted together on to the ship. If the weight and/or cargo dimensions exceed the limits for a pre-lashed shipment, the cargo must be loaded conventionally, also referred to as break bulk. This involves first putting flat racks as foundation in the ship. Wooden beams or steel girders are then laid-out for load distribution and the cargo loaded with the container crane or a floating crane on top, after which the cargo is secured. AI Logistics provides open-top containers (roof protected only with a tarpaulin), hard-top containers (roof made out of steel and detachable) and flat rack containers (reinforced floor, no side walls and no roof) in 20‘ and 40‘ lengths for transporting cargo with excess size. It should be noted that the floor design of open-top and hard-top containers is the same as for standard containers. Flat racks have two much stronger longitudinal beams outside as floor construction, which can carry much higher selective stresses. If heavy cargo is being carried that is very narrow and rests not on the main girder but only in the middle on the weaker wooden floor, bedding must be laid athwart under the cargo so that the weight is transferred onto the main girder. Flat racks can be loaded with the maximum payload only if the cargo stands over the full floor length on the flat rack. Less weight can thus be loaded for shorter consignments. The exact details are obtainable from our loading specialists. The decision on whether or not an item of cargo has excess dimensions or what equipment is most suitable for transport depends on the dimensions such as length, width, height and weight. The type, form and floor structure of the cargo also plays a role. If one limit value for standard containers is exceeded, special containers must be used. Open-top containers are suitable for light, high cargo or for long consignments that cannot be lifted through the door. If the cargo is wider than the roof opening or heavier than the weight limits, flat racks must be used. Corner castings must be kept free for lifting. It is not permitted to raise a platform with one end wall up and the other down. Both end walls must always be either up or down. Special care must be taken to secure the cargo against movement lengthwise. Platforms can be loaded only on deck. Securing cargo in these containers always involves a mixture of lashing and chocking. Chocking protects the cargo against slipping. To secure lengthwise, wooden beams are to be laid-out between cargo and corner posts of the container. Chocking crosswise should be done as far below as possible against the side walls. The forces must be distributed over an area as large as possible by horizontal timbers. Side and front walls are not designed for selective stresses. Lashings prevent cargo tipping and increase the friction on the floor. All open-top containers have small lashing eyes on the corner posts, as well as on the floor and on the roof rails, each with a Maximum Securing Load (MSL) of 1-2t. As for open-top containers, securing cargo on a flat rack must involve a combination of lashing and chocking. The cargo also has to be protected against environmental influences. The flat racks have lashing eyes on both sides and the front ends. All lashing points have a Maximum Securing Load (MSL) of 5t. The lashing secures the cargo against tipping and holds it down to increase friction. It is not sufficient just to lash over the cargo. The preferred lashing method is cross lashing. However, lashing eyes on the cargo are required for this. Otherwise, it is necessary to lash around the cargo, also referred to as loop lashing. The strap or wire is passed from one side over the cargo, and then under the cargo back to the starting point. The same procedure must always be repeated beginning on the other side. The various lashing methods are illustrated below. It is possible to chock very effectively lengthwise against the corner posts. Wooden wedges, nailed on the wooden floor of the flat-racks, must not be used, as these are mostly not adequate and damage the floor. Most flat racks have notches for stanchions along the side. Ordinary steel beams, inserted vertically into these holes, can be used as chocking against slipping sideways, for example, for lengthy items such as pipes. When case will be stacked on top of each other and for increasing friction serrated steel plates can be applied. These look like serrated washers and are placed between the crate and the wooden floor. They are fixed in position with nails or by the weight of the cargo. These serrated steel plates increase friction. It is vital to display a marking on the crate to inform persons inspecting the cargo of the securing material used. In addition to being secured by serrated steel plates, the cargo must also, of course, be lashed. It is vital to use edge protection to prevent straps chafing and tearing on sharp edges. This also protects soft wooden cases against being broken or cut into by the lashing materials, and prevents the resulting loosening of securing equipment. Cargo is normally loaded on flat racks below deck for protection against water. Containerships have guide rails in their holds to keep containers in position. These guide rails reduce the maximum loading length for shipments with excessive width (more than 244 cm) even if the cargo would fit on the flat rack. The maximum permitted length for cargo with excess width is 1160 cm on 40‘ flat racks and 550 cm on 20‘ flat racks. In other words, the cargo must be stowed at least 30 cm from the outer ends of the flat racks. Cargo that exceeds the limits for pre-lashed consignments has to be loaded conventionally. These limits depend on a wide variety of factors and can be checked individually by AI Logistics. Every conventional consignment requires special treatment, so a special procedure is used for every booking at AI Logistics. Many people are involved in preparing and carrying out conventional shipments. Experts check whether or not the cargo can be loaded and if so how, formulating stow-age proposals and lashing plans. The AI Logistics agencies in the ports where cargo is loaded and unloaded calculate the probable costs and clarify all details of cargo handling with the local companies. AI Logistics can offer reliable transport for most large and heavy items of cargo. 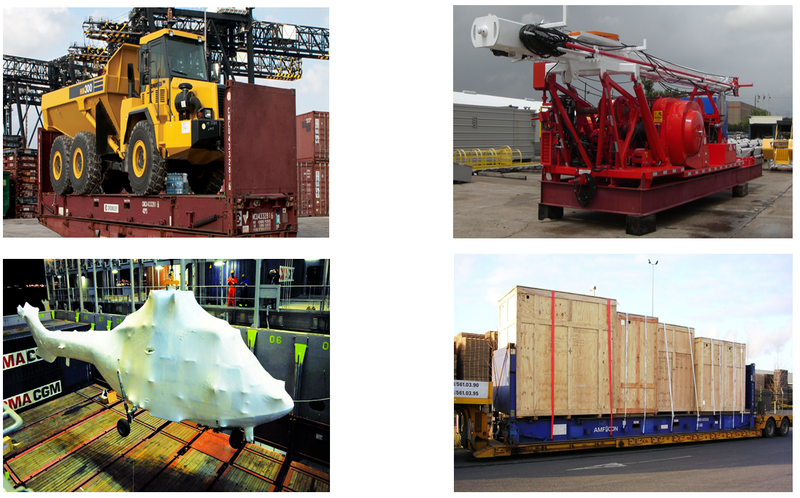 Some examples of types of cargo carried are given below. What items are suitable to be transported in OOG? Construction machinery, precise instruments, oil equipment, harbor machinery, power generation equipment, yacht, large steel, glass work and kinds of vehicles etc., all these items could not be handled by manual workforce, are suitable to be loaded in OOG containers in way of liner ship, to save cost and shorten voyage. Rate of OOG special container differs a lot from the general container, and it's calculation is based on the following factors, the rate of general container, size of items, weight, space situation, container resource, the loading-bearing capacity of wharf crane, the vessel (whether the vessel is carrier's mother vessel) and the route, etc. The integrated factors finally determine the rate of OOG container. So when there is inquiry, we need to be provided the basic information like loading port, destination port, container type and quantity, size weight and photo of the cargo.